Etta Marr is an amazing woman. She came from hardships difficult to imagine by today’s standards but she brought from that background uncommon strength and a sense of herself that seemed unshakeable. 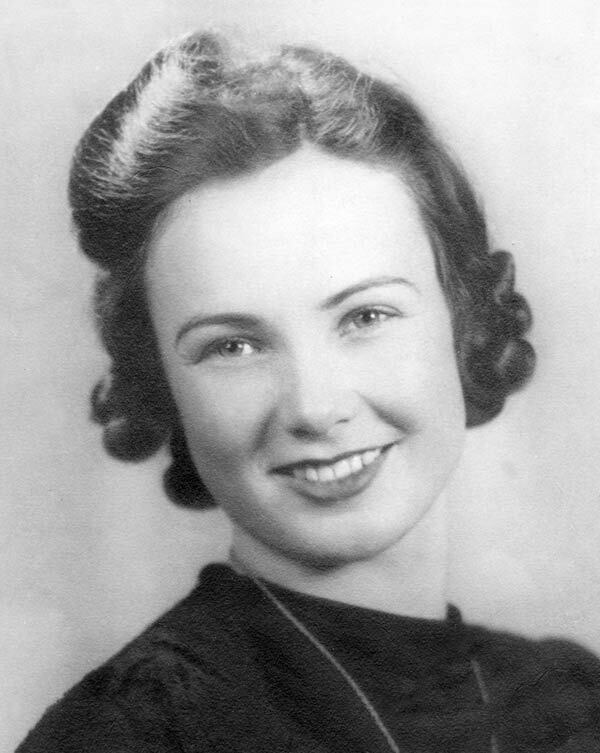 She has been a “rock” on which this family has anchored itself for over seventy years and has been a wonderful mother to Ann and I. 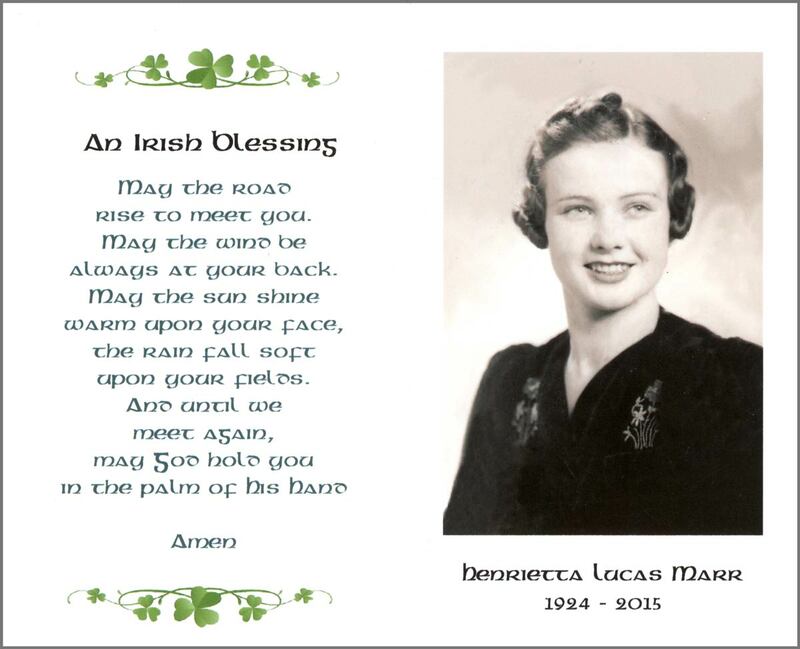 Born April 24th, 1922 in Dungannon in County Tyrone in what is now Northern Ireland she is now ninety four years old. As I write this she is in hospital and at her age this is always serious. Now seems like a good time to take a few minutes to look back on her life. I don’t know if Mother didn’t know the details of her journey to Canada or she just did not want to talk of it. She did not like her father and would simply not talk of him or the family history. I tried to ask questions but she simply refused to discuss it in spite of my urging. From what I gather, her father was a hard man, given to drink and to bullying his family. Apparently, being Protestant, he was in fear for his life, and those of his family, during the troubles that followed the Easter Uprising of 1916 and was advised to leave Ireland. Ann says that she heard that he was an “enforcer” for the Protestants and heavily involved in the civil strife that was going on at the time. This would have made him a target for the IRA. He applied for immigration to Canada and when Mom was four years old they left the house one night, went down to the port, I don’t know which one, sailed to Halifax. She really remembered little of Ireland although she did talk of the fireplace in their home and her mother cooking in it. She tells of the ledge around the inside of the fireplace on which potatoes sat and cooked slowly in the heat of the fire. These were given to the children as snacks and she remembers them as a great treat. Mom remembered the trip over on the boat. No details, but, she was a cute little four year old girl and she remembered everyone was giving her candy and deserts. 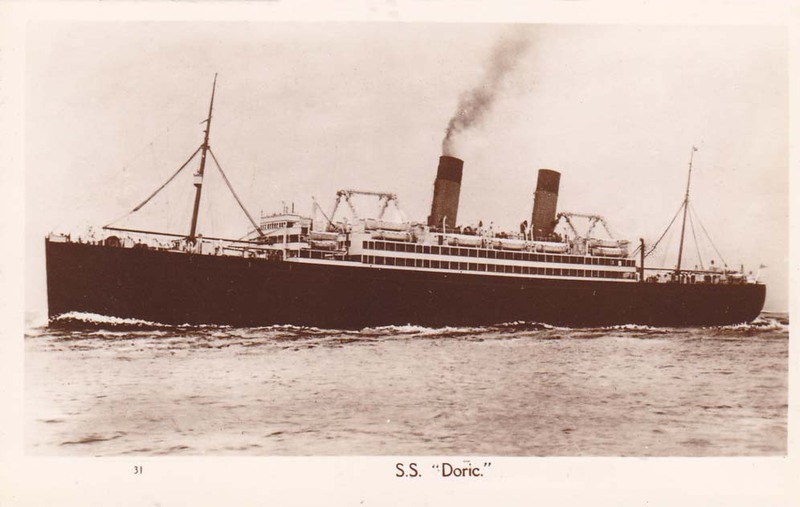 In fact they sailed on the White Star Line’s S.S. Doric and arrived in Halifax at Pier 2 on March 27th, 1926. As an immigrant her father was given a grant of land in the Rural Municipality of Milton in Saskatchewan. The 2001 census says it had a population of 199. You can imagine what it was like in the 1920’s! To this day Mother is a city girl. She dislikes the country and farms. The land was flat and difficult and life was not easy. Apparently her father drank and was violent with her mother, and, I suspect, the children. Her mother developed diabetes and there was no insulin in those days. She died when Mom was very young and father remarried. It was a large family but I know little of them. 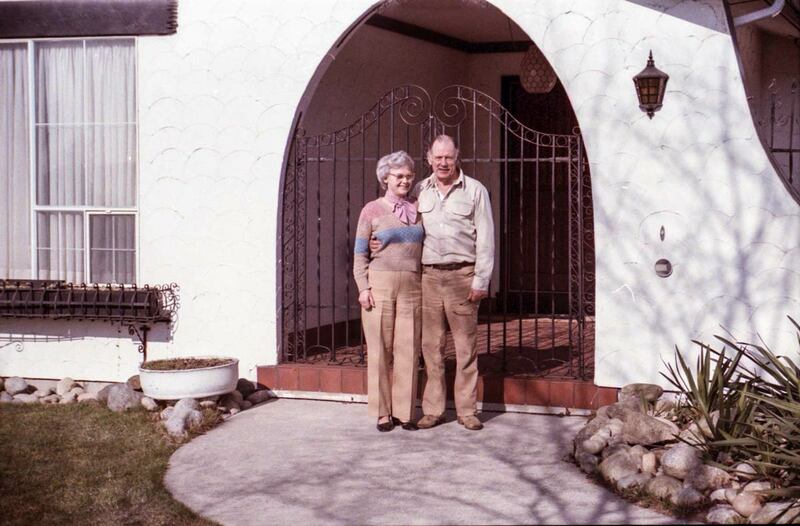 When I was a child we used to visit Auntie Greta in North Vancouver but even that connection was lost over the years. I remember my Uncle David having met him on one occasion. But the McAteers were never a close family. The story goes that her father was beating up her stepmother, of whom she was very fond, when Mom was fifteen and to stop it mother hit him with a frying pan and laid him out on the floor. 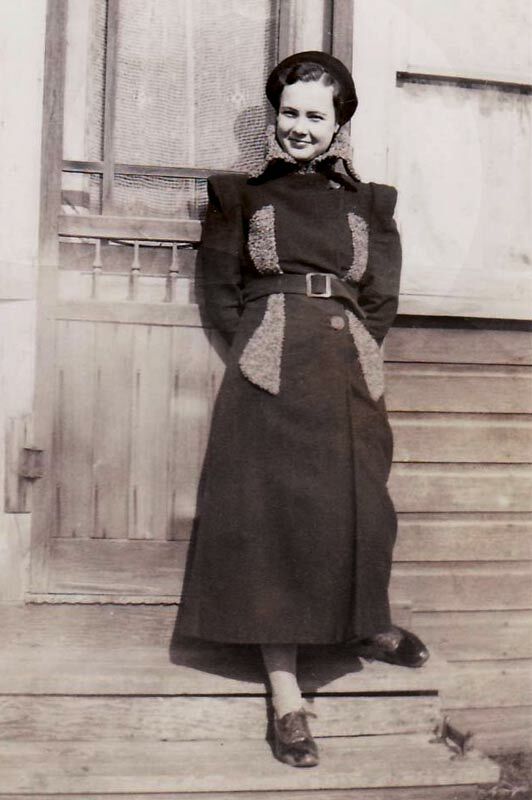 Her step mother knew that Etta had to get out of there before the old man woke up so she gave her some money and got her down to the train to get out of town. True or not I can’t say but I have heard this story from Dad many times. Apparently Mom went to Saskatoon. I assume in a state of great agitation and confusion. However, she would never discuss her childhood or family. I think it hurt her that much that the subject was off limits to us. 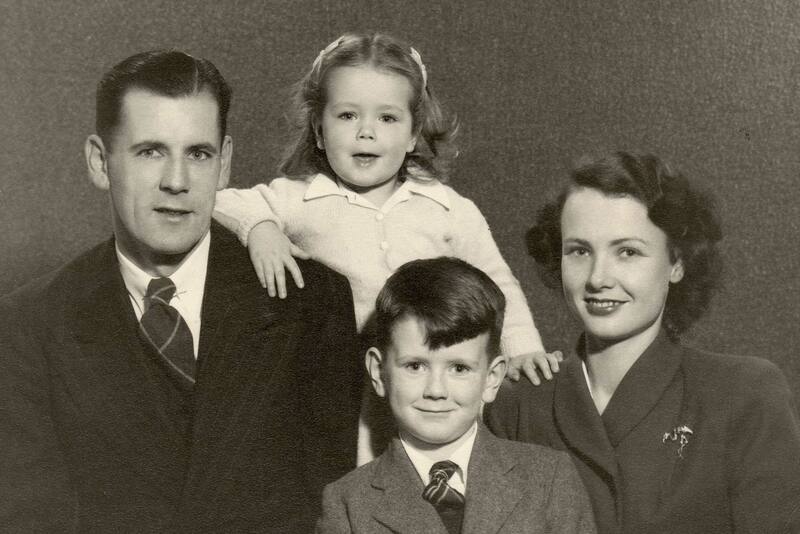 As a result Ann and I have little or no knowledge of our family on mother’s side. 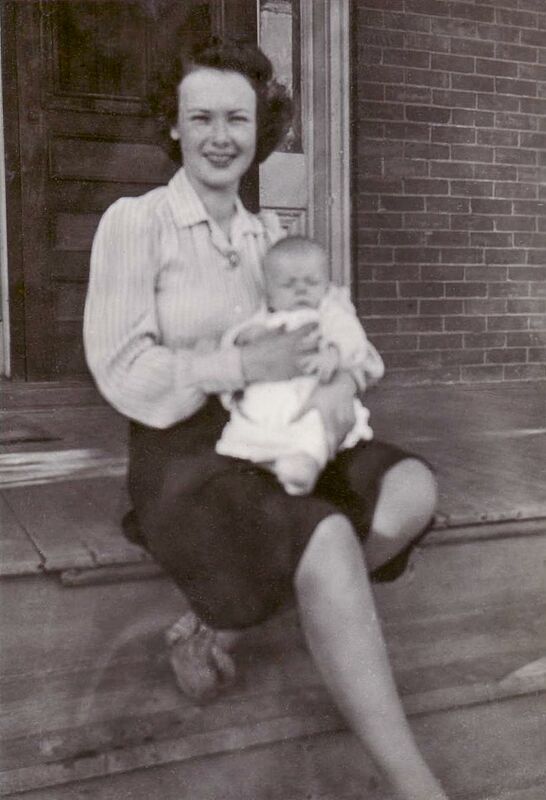 While in Saskatoon Mother apparently met a woman from Toronto named Vera Michi who took Mom under her wing. She understood Mother did not want to go home so she took her to Toronto with her and took her in while Mom got established. 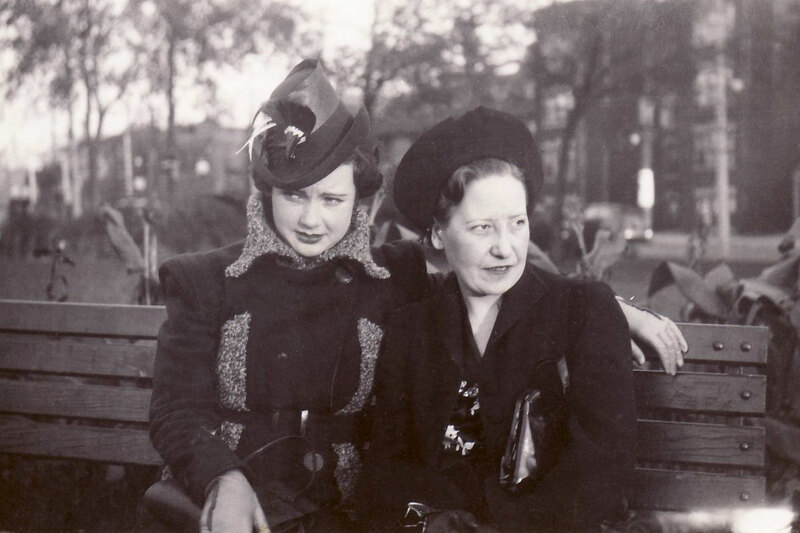 Etta and Vera Michie in Toronto. 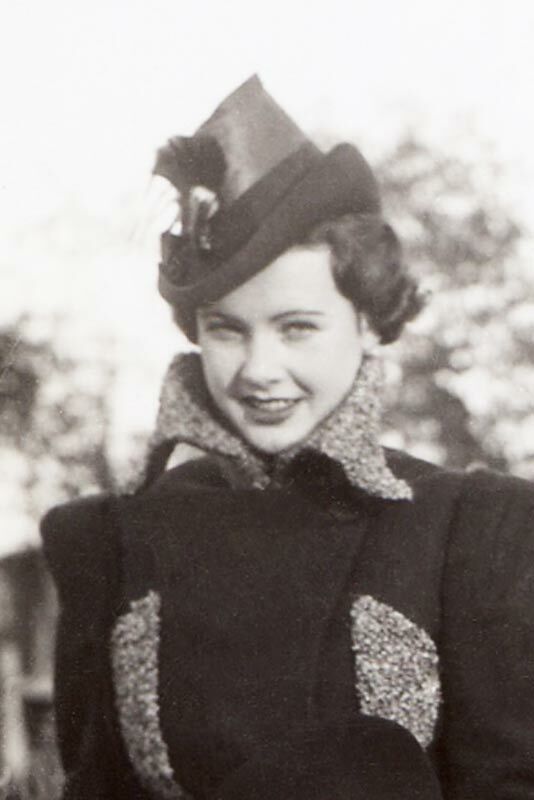 This picture was taken in 1939 before she meet Bill Marr. Mom got a job working at Queen’s Park which is what the provincial government offices are called in Toronto. 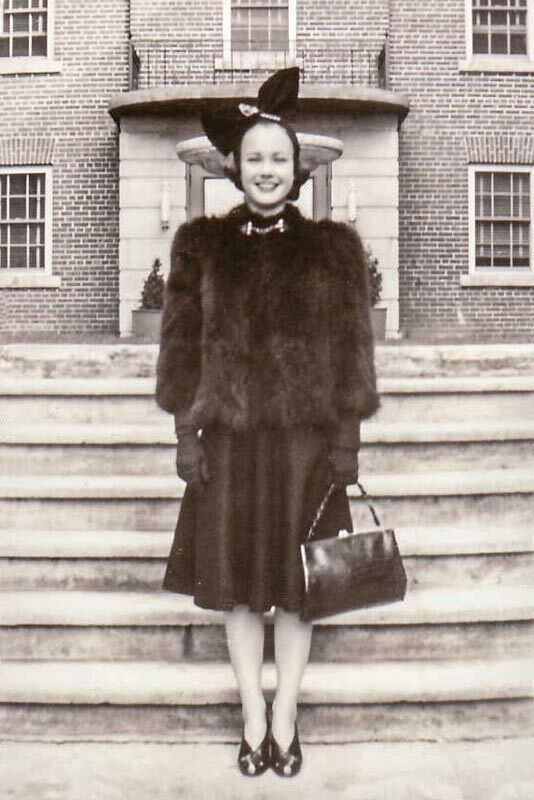 She boarded with a Mrs. Hollingsworth and became great friends with her daughter, Jean. This became a life long friendship and I knew Jean well. She became my Auntie Jean and eventually ended up living on Saltspring Island. And that is really all I know about Mom’s life in Toronto before she met Dad. As for these pictures, remember that photography in those days was not common, especially in the rural communities. People did not take many pictures. As far as I know, these are the earliest pictures of Etta that we have. Of course there was no color photography in the 1930’s and 40’s so everything is black and white and occasionally hand colored, like the photo above. So how did Mother meet Bill Marr. Well, again we have to rely on family stories. 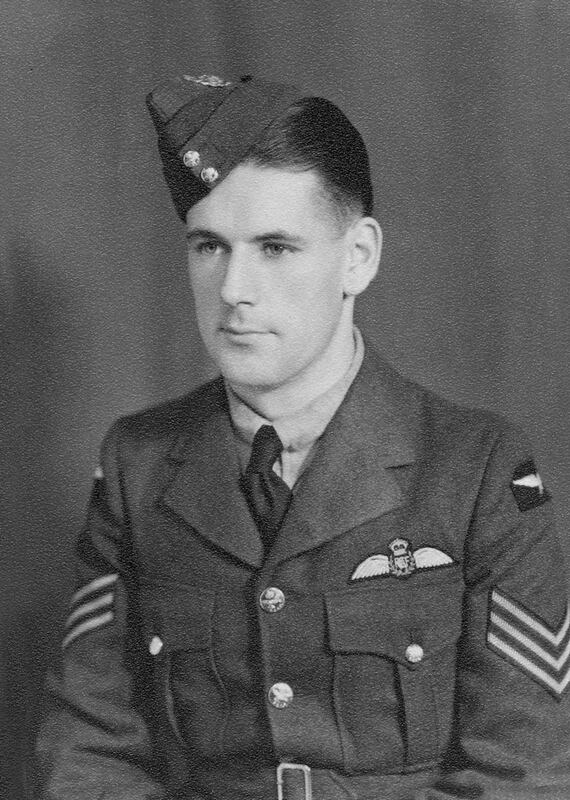 Bill Marr had been training with the Commonwealth Air Training Plan and had come from Saskatoon to Toronto to await a posting. He was billeted in the Royal York Hotel, as many service men were, and he tells me that it was one continuous party. These were all young men from across the country, most never away from home before, all thrown in together with expenses paid for by the government. Of course it was a party! Dad had made a friend, Al Lowe, and they were billeted together. One day they saw a poster advertising a day trip on Lake Ontario being put on for servicemen. They decided it sounded like fun and so they bought tickets. The trip was on the S.S. Cayuga. Let’s stop a minute and talk of the Cayuga. She was a twin screw steamship launched in 1906 and named after one the tribes of the Six Nations Confederacy. Capable of carrying 1900 passengers she was a part of Toronto life for several decades. She sailed between Toronto and Port Dalhousie on the Niagara Peninsula carrying passengers, cars, general cargo and bringing back fruit and produce from the Peninsula for the Toronto Market. The trip was two hours each way and in the forties cost one dollar. On the outside decks were long rows of benches backing on the ships superstructure offering a view of the harbor and Toronto skyline. In those days the skyline consisted of the massive Royal York Hotel, the Bank of Commerce Building, the old City Hall clock tower and the spire of St. James Cathedral. The ship inside had a large Main Lounge, a dinning room, and even a dance floor as fine as any hotels’ in the City. Anyway, at work Mom and her girlfriends belonged to a women’s organization called the Women’s League of Health and Beauty and they arranged to go on this outing. They were to each pack a lunch for two and they would be paired up with a service man for the trip. Now the story we have always been told was that Mom was sitting on one of the long benches on the deck with people strolling by in front of them. Dad an Al were there in the crowd and when Mom saw him she put out her foot and tripped him. At least that is how Dad tells this story and Mother never contradicted it. She would just smile! So they spent the rest of the outing together and when they got back Dad saw Mom home on the street car on which he spend his last dollar. He had to walk back to the hotel, which was some distance apparently, because he was out of money. After that they were inseparable. 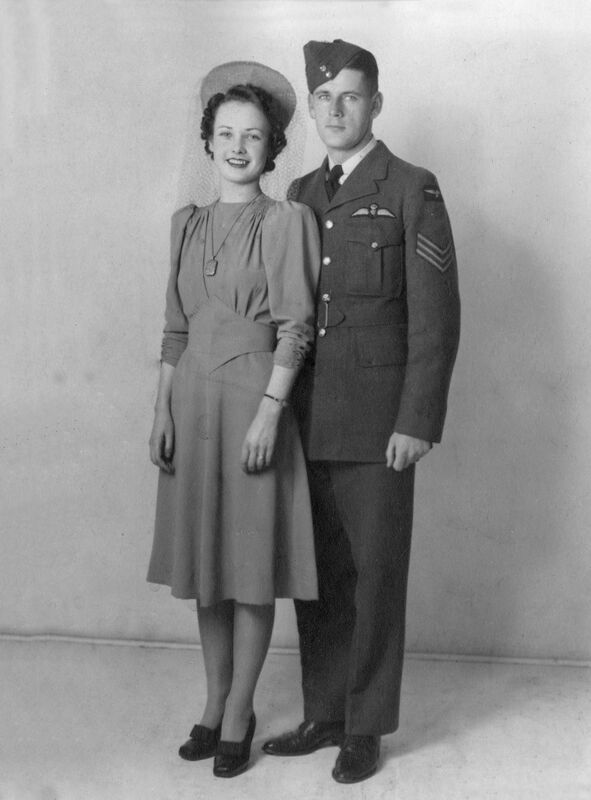 Dad was posted to the air base at Trenton, about 200 miles from Toronto, but somehow they continued to see each other and their relationship grew. 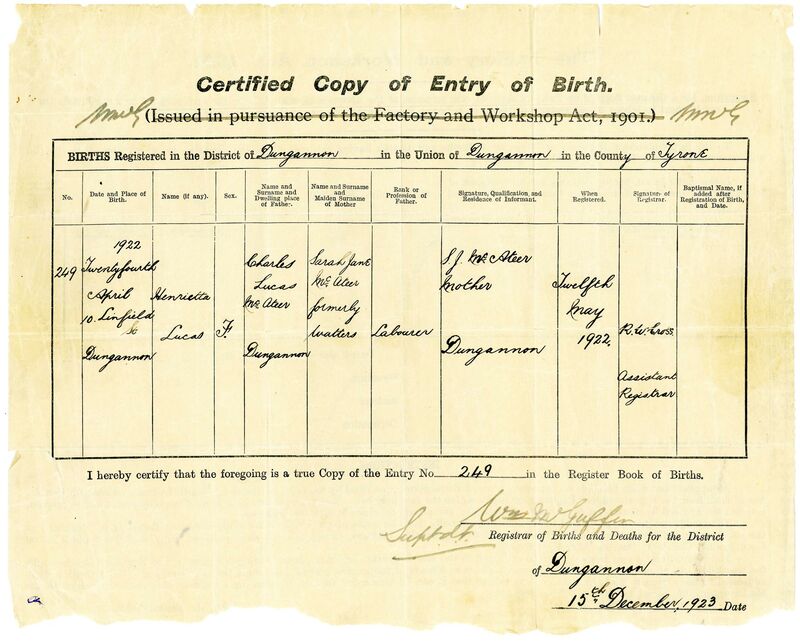 However, if you check Grandpa’s log book, you will see that he was posted to Moncton, New Brunswick. His first flight there is recorded as March 3rd, 1941. Dad was apparently not very happy because he phoned Mom and suggested she come to Moncton and marry him. She did. 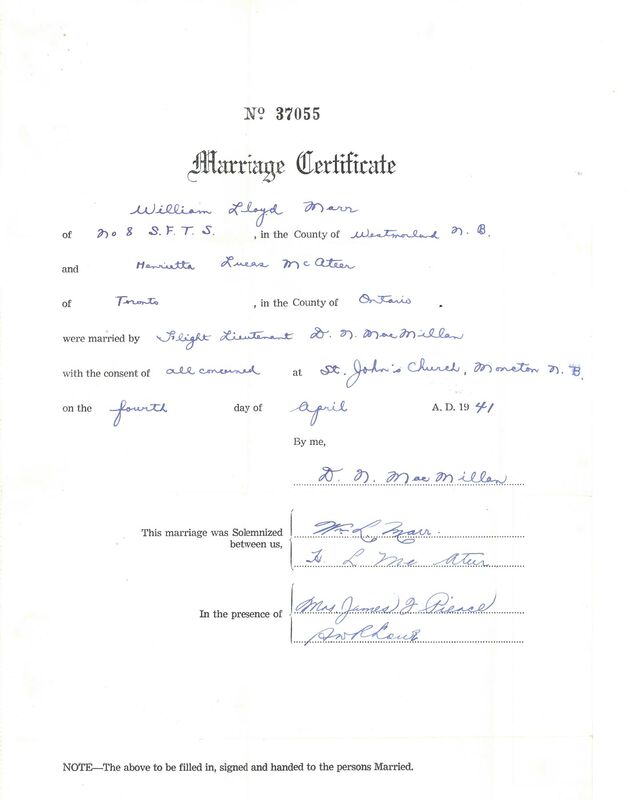 4 April 1941 Mom and dad were married in St. Andrew’s Church, Moncton, New Brunswick. Dad’s flight log is interesting. If you go to the 4th of April you will see that he did two flights that day of an hour and twenty minutes each in Anson #1586. But he did mention the wedding in his log book! If you look carefully there is a very small symbol and initials: WLM above and ELM below. Now the inside front cover says that “this book is an official document and is the property of His Majesty’s Government”. So the marriage must have been official! It is hard to image those days. Europe was aflame with war, uniforms of all the services were seen everywhere, battle reports and casualty lists filled the pages of the newspapers. 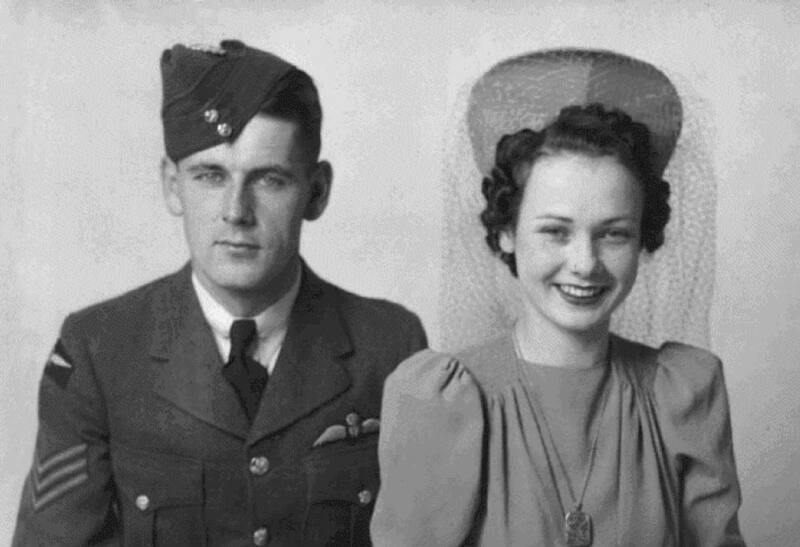 And Etta’s new husband was flying every day training young pilots for the war. In fact, he was so good at it that in August of 1940 he was transferred back to the Central Flying School, Trenton, to become an instructor of instructors. They took up residence in Belleville which was just down the road from Trenton. And it was here that Mother’s life took another big turn: I was born. What an insecure time to have a baby: a war on, Dad maybe called away to Europe, Air Force pay! It must have been scary! There are good reasons why they leave the babies to young people: they are so full of hope. But this was not a fairy tale. Dad was posted overseas. His last flight out of Trenton was 21 September of 1942 and his first flight overseas was on the 11th of December. In the intervening two months Dad took Etta back to Fort Langley where he put her up in his Grand Mother MacIntosh’s house. It was here that Mom and I spent the war years. It was in this house that I have my earliest recollections and ever since I have had fond memories of Fort Langley. The years in Fort Langley were not happy for Mom. As already pointed out, she was not a country girl and in those days Fort Langley was as “country” as it gets. While waiting for Dad she had the photo to the left taken to send overseas to him. 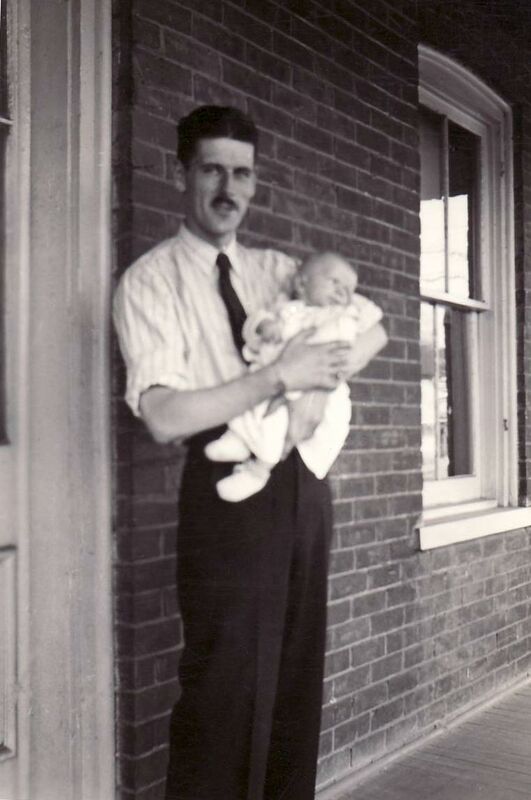 As the war wound down Dad took advantage of an opportunity at Trans Canada Airlines and came home to a job with the airline. We all moved to Winnipeg for his training on the Lockheed Model 18 “Lodestar”. 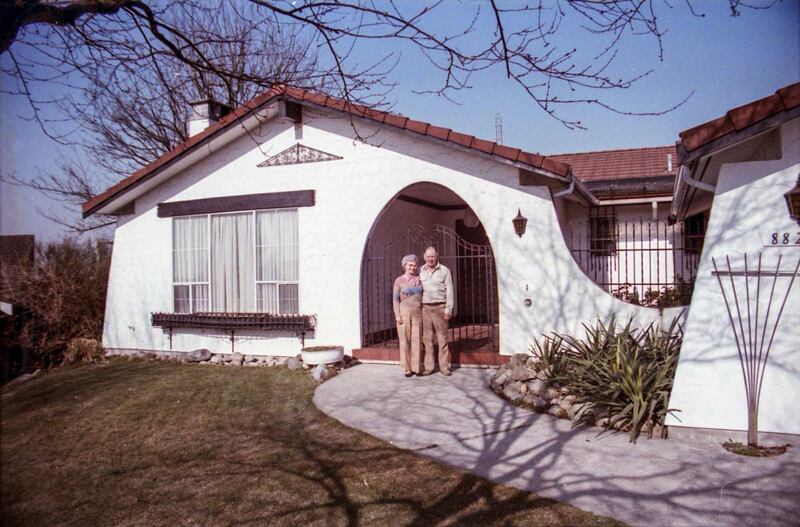 Once this was done we returned to New Westminster where Mom set up house in a new home they purchased in 1946: 422 – 2nd Street. 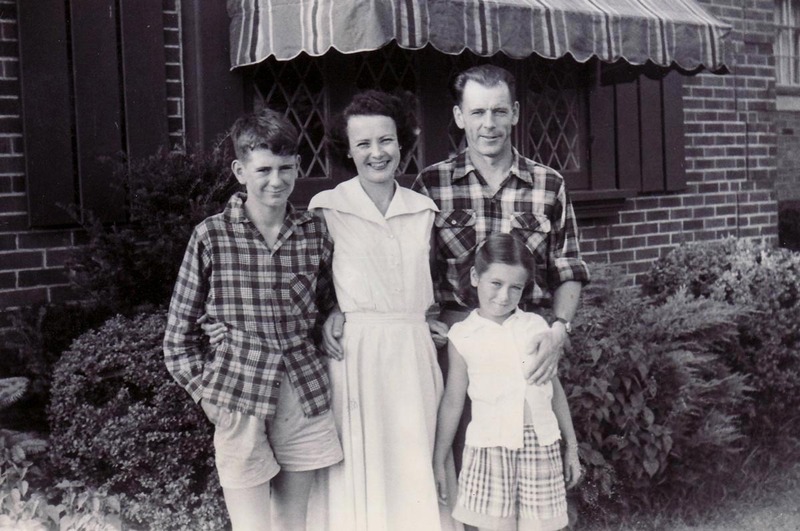 It was in this house that Mom had her second child, Katherine Ann, on 23 April 1947. It was a happy home. I am sure Mom and Dad had their disagreements but never in front of us kids. What we did see was the easy affection between them and a united front whenever we children stepped out of line. An and I both remember our upbringing as wonderful and full of joy and adventure. By 1950 Dad realized that the center of operations for TCA where in Toronto and that is where you had to be for promotions and the best routes. 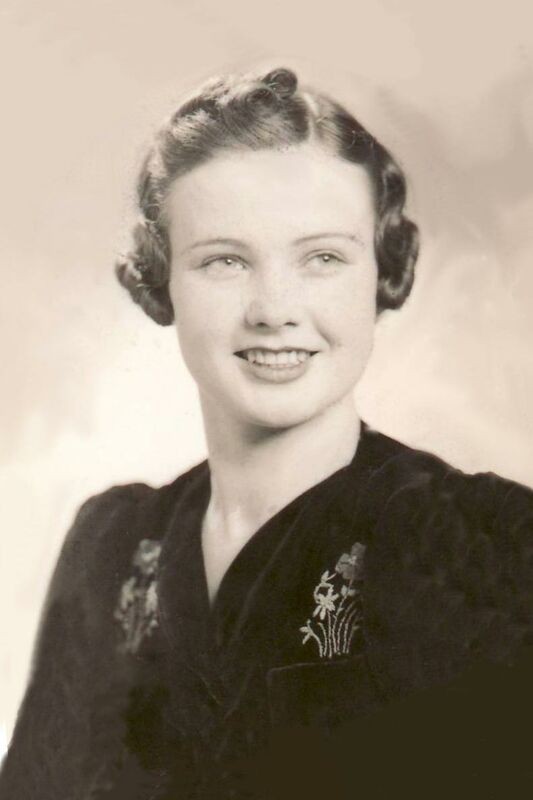 Mother had always loved Toronto and was eager to return there. So Dad put in for a transfer and in 1952 the family moved. The little house on 2nd Street was sold and we moved into our new home at 28 Glenaden Avenue West, Toronto 18. Here we are outside the house at 28 Glenaden Avenue West in Toronto. We arrived in Toronto in 1952 and this would have been taken a couple of years later, about 1954. When Mom and Dad moved back to the coast they rented a very nice town home near Oak and 41st behind Oakridge Shopping Center. But eventually they moved into a home in Delwood Park just off River Road in Delta. It was a beautiful home and we had many happy family get togethers there. 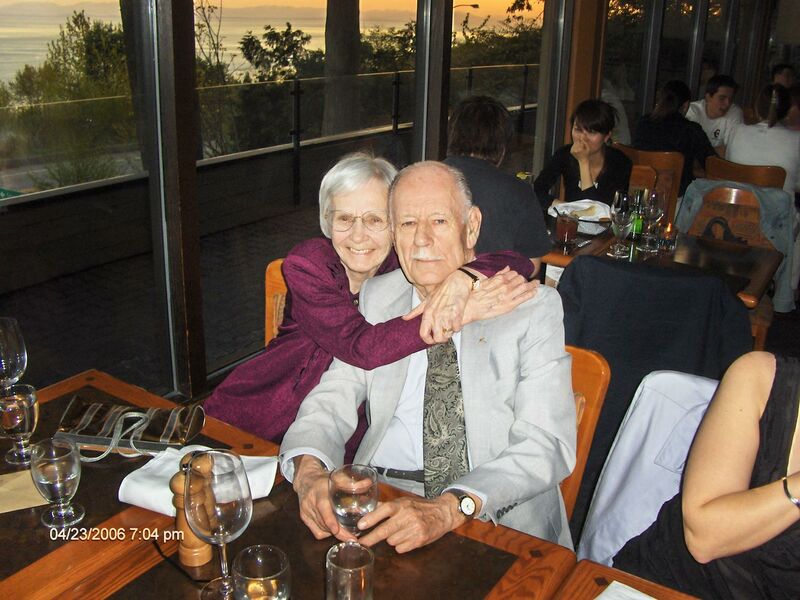 In 2006 for Mom’s birthday Susan, Ann and I went with Mom and Dad to the Salmon House in West Vancouver for dinner. In 2009 Dad surprised us by taking Ann and I and Mom on a five day cruise to Alaska and back. 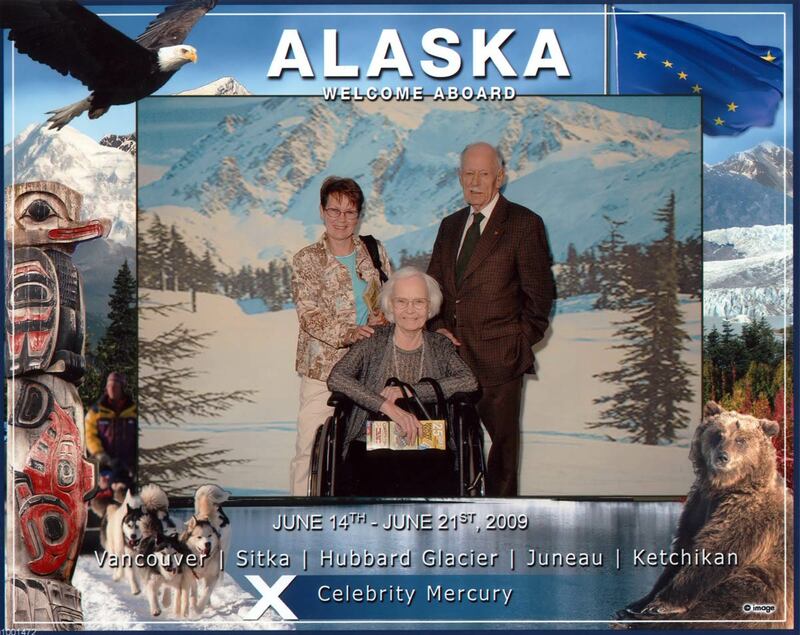 We had a great time but it was Mom’s last trip, after a lifetime of travel. It was nice that it was with her husband and two children. Here we are all together for the photographer on the ship. 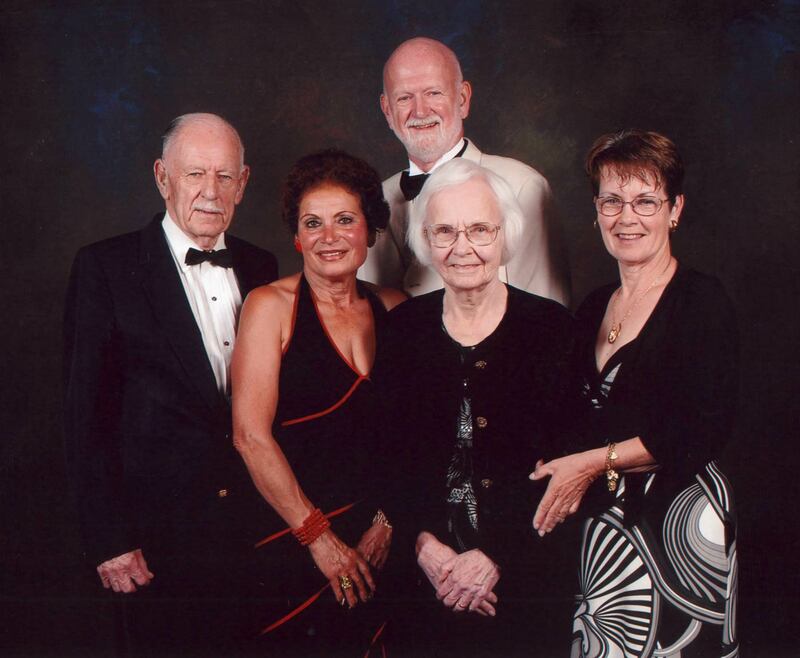 We had a wonderful time but Mom was obviously stressed by it and actually spent a night in the ship’s infirmary. Too much sun, rum and food. 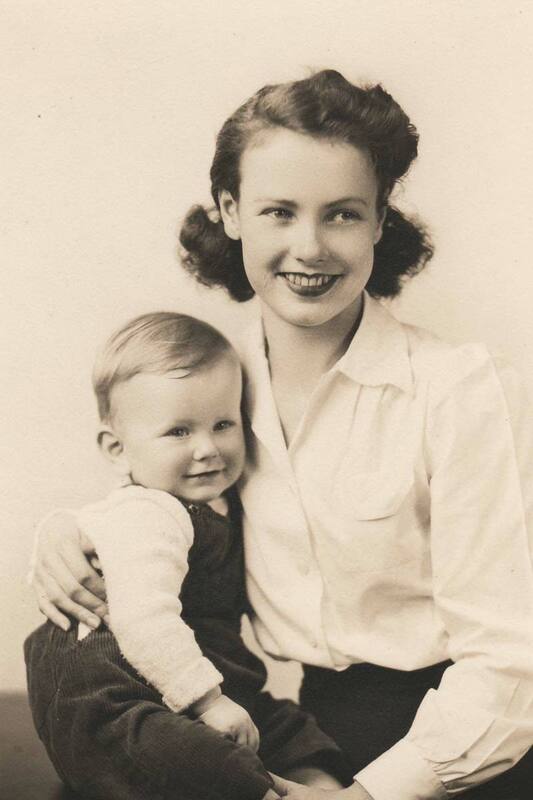 I began writing this little piece about mother because she had become ill and I had taken her up to Langley Hospital. Ann and I thought she might not be coming home. In fact, about ten days later she died. She was tired and I think she had had enough. She had always told us that she did not want to linger, she did not want to be tied to machines, that she was not afraid to go when it was her time. It was her time. Many have expressed their sorrow at her passing. 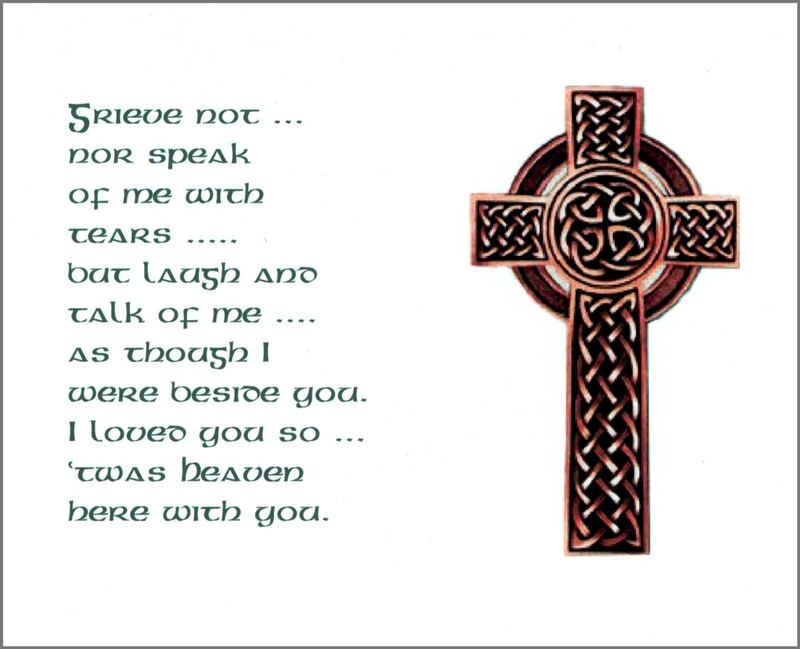 Although I miss her terribly and can be reduced to tears at her memory as it drifts across my consciousness, I cannot be sad for her. She lived a full life, she lived with her husband in her own home till she was 94, and she spent only a few days in the hospital. How can one be sad in the face of a life so well lived.